Is Tilbury fort haunted? Well personally I cant think of any major British military structure that isn't said to be haunted, not a single one. The fort does have one thing that most other haunted places do not though, and that's its own Royal spirit. 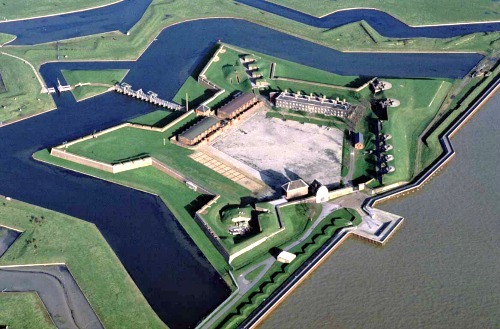 The fort itself has served as an important military instillation in its lifetime which began in 1670 for the first permanent defensive structure, though it wasn't completed until 1682. Defences have been present here to defend the river Thames against naval attacks since the 14th century, and the structure has been constantly improved and expanded over time. During the 19th century the fort saw a complete re-design, with gun emplacements being added and a complete rebuild of the river side of the fort. The structure which can be seen today stands in the condition it was in since its last update, which was shortly before the first world war were more modern weaponry was installed. Today the fort is cared for by "English Heritage" and is the finest surviving fort which still holds alot of its original 17th century design. It is open to the public but please check with the venue directly to ensure correct opening times. Since it is a very old military structure you can only imagine that there is a pretty good chance it's haunted, as are most other forts and castles. This one however is thought to have a royal resident who still walks the walls, with many believing the spirit to be that of Queen Elizabeth I. The reason she still haunts here though is a mystery, if it even is her, but people have reported seeing the apparition of a woman dressed in an exquisite gown standing on the walls looking out over the river, only to fade away a few seconds after appearing. Paranormal occurrences at the fort are no where near as common as its neibour, Coalhouse Fort, which is about 3 miles away along the river. But that's not to say many visitors have not experienced some spooky goings on here. As you may have guessed most of the sightings and activity are thought to be caused by past soldiers posted here, with the most common of which being the sounds of soldiers marching in the courtyard, both at day and night with no possible explaination as to where the noise is coming from. The tunnels under the fort are believed to be the hotspot of the site, with tales of a strange mist forming in certain places in the tunnel when people are walking through. An investigation group called Haunted Earth did an investigation here and captured an interesting EVP in the gunpowder room which sounds like someone saying "boys kill the boy". A group member also claimed to have contacted a spirit called "Sergeant Porter" from the late 1800's and also a man named Duffield in one of the display rooms.